If you're on a mission for a casual yet totally stylish getup, wear a Calvin Klein Jeans western lean contrast denim shirt and black skinny jeans. Both pieces are totally comfy and will look fabulous together. Purple low top sneakers will add a sportier vibe to your getup. 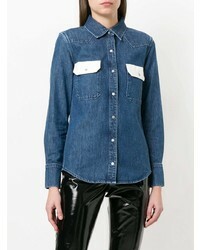 If you're looking for a casual yet totally chic look, team a Calvin Klein Jeans western lean contrast denim shirt from farfetch.com with a light blue ripped denim pencil skirt. Both pieces are totally comfy and will look fabulous together. Perk up your look with tan leather pumps. 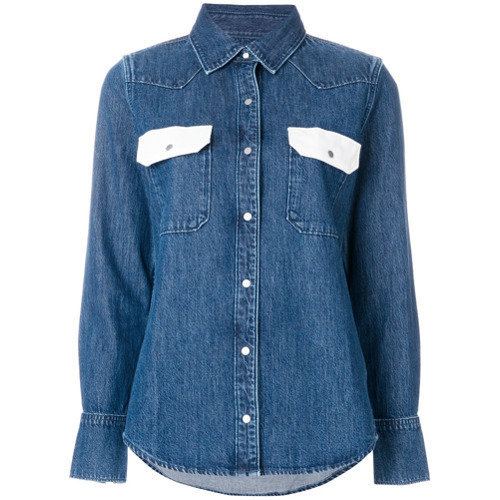 If you're in search of a casual yet chic ensemble, consider teaming a Calvin Klein Jeans western lean contrast denim shirt from farfetch.com with blue boyfriend jeans. Both pieces are totally comfy and will look fabulous together. If you're all about relaxed dressing when it comes to your personal style, you'll love this stylish combination of a Calvin Klein Jeans western lean contrast denim shirt and black leather leggings. When it comes to shoes, this getup is round off wonderfully with tobacco leather lace-up flat boots. If you don't like trying-too-hard combos, try teaming a Calvin Klein Jeans western lean contrast denim shirt from farfetch.com with a black pleated leather mini skirt. 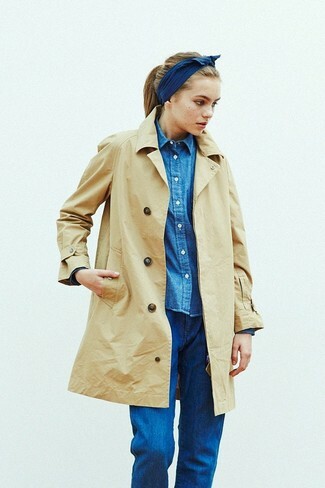 If you're on the lookout for a casual yet totally chic ensemble, opt for a Calvin Klein Jeans western lean contrast denim shirt from farfetch.com and blue ripped skinny jeans. Both garments are totally comfy and will look fabulous paired together. Complement your ensemble with tan leather espadrilles. If you're looking for a casual yet totally chic outfit, rock a Calvin Klein Jeans western lean contrast denim shirt with black skinny jeans. Both items are totally comfy and will look fabulous together. For something more on the daring side to round off this ensemble, throw in a pair of silver leather low top sneakers. This combination of a blue denim shirt and white jeans is simple, totally stylish and oh-so-easy to recreate! For something more on the daring side to complete this ensemble, go for a pair of beige leopard espadrilles. If you're hunting for a casual yet stylish outfit, try teaming a Calvin Klein Jeans western lean contrast denim shirt with a beige polka dot pencil skirt. Both items are totally comfy and will look fabulous paired together. When it comes to shoes, this outfit is complemented well with tan leather heeled sandals.